2015 was a great year for FreePBX with over 6,300 commits from 50 contributors. 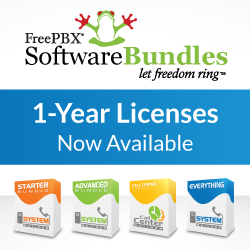 Through the contributions of the community and with the strong backing of Sangoma, FreePBX has made great strides to being the best PBX platform and a great open source project. We started working on FreePBX 13 over a year ago and have touched almost every aspect of the GUI. We have also made great strides in the internal plumbing. We have made FreePBX faster and more secure. Internally we have been “dogfooding” FreePBX 13 and from a development standpoint we have treated it as release. We have watched the adoption of FreePBX 13 grow to over 11,000 installs and have caught and fixed many small edge case bugs. We are happy to remove the RC badge and make FreePBX 13 officially stable. Users running FreePBX 13 don’t need to do anything. Users of FreePBX 12 can use the FreePBX Upgrade tool to update to FreePBX 13 automatically. As adoption grows there may be things we missed. If you find any issues please open a bug at http://issues.freepbx.org. It was a good year indeed. Congratulations to the FreePBX team! My managers are jealous of what Microsoft Lync and 3CX can do. Recently a salesman gave them a good presentation on Web conferencing with 3CX, which made a fairly good impression. Unfortunately, that is not something I can give them with FreePBX. UC in my opinion is where FreePBX is lacking. There is a high demand out there and any advances in the area would be a great selling point. Screen sharing, video calling, chat, etc. The chat function in User Control Panel is a nice idea, but unfortunately it is too basic too be useful. People in my corporation don't use it, because they go to UCP only when they need something specific, like check call history, conference, etc, which doesn't happen very often during the day. For this reason when people do log in, they never find somebody online and give the chat up. They also don't like keeping the UCP browser window open, just because they might get a message. Chat is useful if the program is integrated into something that people are already using, like Outlook, or into something bigger like web meetings, etc. I hope Sangoma will put some thought into that, cause the competition has more to offer there. Chat is XMPP so it could be used with any desktop client?